Here’s an update on accessing Library resources within the Library Building, even though many other areas are closed for Library Refurbishment Project construction work. Large size arts & hums books have moved up to our 4th Floor; normal sized items down to the 2nd Floor. The 2nd and 4th Floors of the Library are open, containing all your books. This includes arts and humanities material, relocated from the now-closed 3rd Floor: normal size material went to the 2nd Floor; larger size and Teaching Practice Collection items to the 4th Floor. 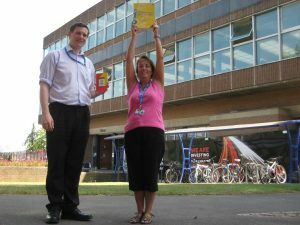 If you need any help finding anything, just ask Library staff at 2nd or 4th Floor Information Desks. A few unique print journals are retained on the 4th Floor, but as most print journals are unavailable until after refurbishment, we encourage you to use our online journals or request an inter-library loan. 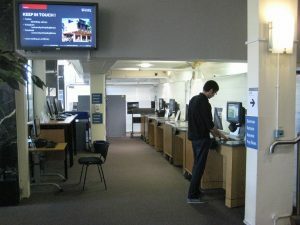 Although much of the Ground Floor is now out-of bounds, we created a small area at the bottom of the main stairs for you to borrow, return or renew your loans at Self-Service Points or use PCs and catalogues. Just ask at the Help Point by the entrance if you need assistance. Ground Floor toilets are also still available. You may have heard construction work in progress from areas closed-off for your safety (Ground Floor, 1st, 3rd and 5th Floors). Our contractors are demolishing internal walls in advance of refurbishing our 1st and Ground Floors; removing staircase 2 before installing new accessible lifts; and preparing to install new heating, ventilation and toilets on our 3rd Floor; besides installing new windows. Find out more about our plans on our Library Refurbishment Project webpage or visit our URS Building display (2nd Floor landing by Café Libro) for images of future development and previously refurbished floors, which will be reinstated. Remember! 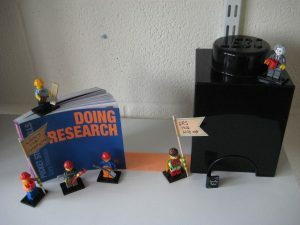 Library Building = books + builders; URS (Lego) Building = study space + services. Remember to visit the URS Building for Library services and study space, next door at the other end of the orange brick road, further away from potential construction noise. This is also where you will find Cafe Libro, Course Collection material and can collect ‘holds’. This entry was posted in Borrowing and viewing material, Cafe, General news, Inter-Library Loans, Opening hours, Refurbishment, Study Advice and Maths Support, Study Space, Vacation information. Bookmark the permalink.